K2 Osteopathy is currently being ran David Such and his associates. If the information you need is not here, or in the new patient form please contact us at enquiries@davidsuch.com. Read more about Osteopathy and how it can help you. On your first visit we will ask you to discuss your medical history, general health and well-being and your symptoms or injuries. Next the practitioner will complete a brief physical examination which will involve touching and examining the areas needing treatment and watching how you move. At this point the practitioner will also review any previous test results, scans or x-rays you have. Your practitioner will make a diagnosis and suggest a course of treatment to suit you. Treatment may include return sessions of manual therapy, exercises you can do at home and longer term changes to your lifestyle. The cost of treatment will be discussed and whether you are happy to proceed. If we do not believe you will benefit from osteopathic or sports injury treatment, it is likely that clients will be referred to their GP or other suitably qualified professional. In the event that your practitioner does not feel osteopathy is suitable for you, notes will be provided explaining your diagnosis and why it is unsuitable. Yes. Under 18’s must be accompanied by a parent or guardian at all times. You can bring a partner or friend if this will make you feel more comfortable. What should I wear? Will I be asked to undress? In order to be accurately assessed and diagnosed, you may be asked to remove clothing from the area being examined and treated, so wearing something simple to remove would be best. A towel and/or disposable shorts are available for your convenience. Manipulation, massage and stretching of muscles and tissue may be a little uncomfortable but is usually very gentle. Your practitioner can explain the sensations you will feel. If the treatment is causing you too much pain they will of course stop and offer alternative treatment. Will I feel worse after treatment? There may be some local soreness where you have been treated, but this is only experienced by a very small number of patients treated. Any pain should ease within a couple of days, but can be relieved with over-the-counter painkillers or anti-inflammatories. On the rare occasion discomfort persists, please contact your practitioner for advice. Are the Osteopaths registered and insured? Yes. 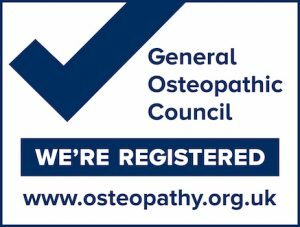 By law, all practising Osteopaths must be registered with the General Osteopathic Council and hold the right insurance in order for them to treat patients. How are my personal details stored and processed? We treat all patients data as completely confidential and will not disclose it to any third party without your written consent. We are a registered data controller with the Information Commissioner’s Office and process, store and treat all data in accordance with the new changes of the GDPR (General Data Protection Regulation) in May 2018. Cancellation policy: Patients are booked every 30 minutes. If you are more than 10 minutes late you may not be seen. If you cancel within 24 hours of your appointment or miss your appointment you may be charged.